To provide quality early childhood education in an accredited parent participation program, fostering the healthy growth and development of preschool age children through developmentally appropriate practices and parent education. We are committed to building strong partnerships among family, teachers, and community in a safe and supportive learning environment, laying a foundation for continued success in a child’s educational experience. We believe that parents are the most important influence on a child's growth and development. MVPNS provides a place where both parents and children can develop together. Under the guidance of qualified and experienced staff, parents participate in every aspect of the program. Parents' contribution of time and energy are key to creating the best possible early childhood experience for their children in the community. 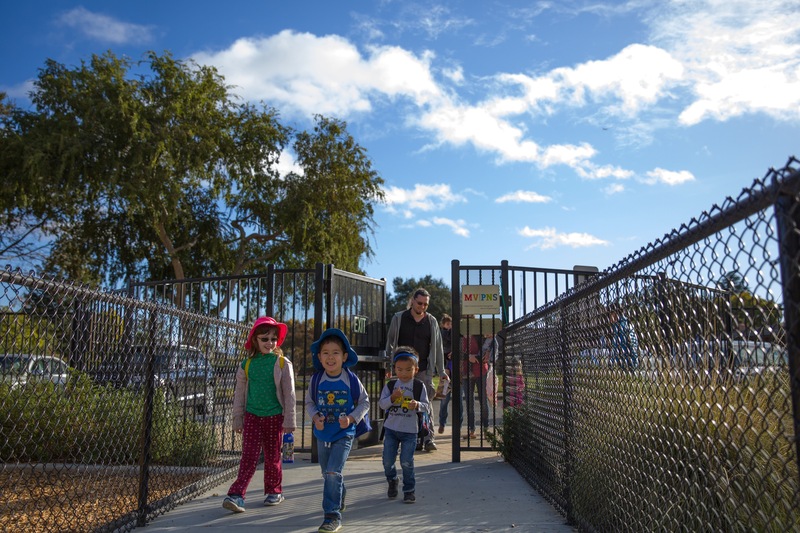 Mountain View Parent Nursery School (MVPNS), accredited by the National Association for the Education of Young Children, was founded in 1969 by a dedicated group of parents who wanted to enroll with their children in a parent participation preschool. The school was established as a non-profit organization in co-sponsorship with Mountain View-Los Altos Union High School District's Adult Education School. Learn more about our great MVPNS teachers! This is the second year that that my twin son and daughter are attending MVPNS, and they absolutely LOVE the school! The teachers are incredibly loving and nurturing, the activities are fun, creative, and educational, and the families all provide a very welcoming and supportive community. As a parent of twins who also works part-time, I was initially hesitant to send my children to a parent co-op, and admittedly, there is a substantial time commitment that comes with all parent co-ops. However, MVPNS is very supportive of families of multiples and tries to be as accommodating as possible. It's truly a great place, and if you live near the Mountain View area, I highly encourage you to check it out! When I first arrived at MVPNS I was told that it would change my life and it did. As a single, adoptive parent I found the staff and families at MVPNS to be extremely supportive. I feel like my daughter and I were embraced by a village that worked with our needs. Since I worked full time, other parents helped to transport my daughter to play dates and day care. The staff were flexible in making sure that I contributed to my school commitments in ways that also supported my attendance at work and limited childcare on weekends. I am certain the flexibility and kindness I received from the MVPNS community cannot be duplicated. In addition to gaining a village, my daughter received the best of a preschool education with creative, well trained and very talented teachers. Everything presented by MVPNS staff was nothing less then stellar, always. I also felt that my daughter's teacher was especially sensitive to my daughter's needs and experience as an adopted child as well. I also found the teacher and director to be an excellent resource to me personally when parenting issues would arise. My MVPNS experience will never be forgotten. As a nurse, I thought I knew a lot about child development and yet after a few minutes at MVPNS, I quickly discovered how much more there was to becoming "the parent I wanted to be." MVPNS is a truly a magical place for children and also for their parents. Learning how to slow down, to listen with full attention, to help name feelings were the tip of the iceberg. The teachers modeled how to foster in children the ability to discover the wonders of the world without hovering or trying to control the journey, but instead, guiding them gently, nurturing creativity and the development of skills that help them feel empowered. What are the parent participation requirements? Weekly work day - Tuesday/Thursday parents work during the school day about two or three times each month. Monday/Wednesday/Friday and Monday/Tuesday/Wednesday/Thursday parents work about three days per month. Four evening parent education meetings with an expert speaker per year. Monthly class meetings during your child's regular class day led by the teacher. Each family serves on a committee or takes a leadership role through our MVPNS Board of Directors. Some examples of committees are community outreach, silent auction, beautification, curriculum support, and finance. In order to keep the equipment and facility safe and attractive, each family contributes six hours of maintenance/beautification work per year. Note that MVPNS board members are exempt from the beautification requirement, so please consider taking on a board level job. Families participate in the two major fundraising events: the fall Down by the Bay 5k race and spring silent auction. Participation in the eScrip program. Special Meetings include welcome coffee in June, orientation meeting in September. How do the children learn through play? We emphasize play and exploration as the primary methods of learning and development. The children are empowered through authentic, collaborative classroom practices. Mathematics and language activities are woven into the various learning areas so that children have the opportunity to explore and develop skills in natural ways. See our Enrollment page for all of the details. What are the differences between MVPNS and other parent participation schools in the area? 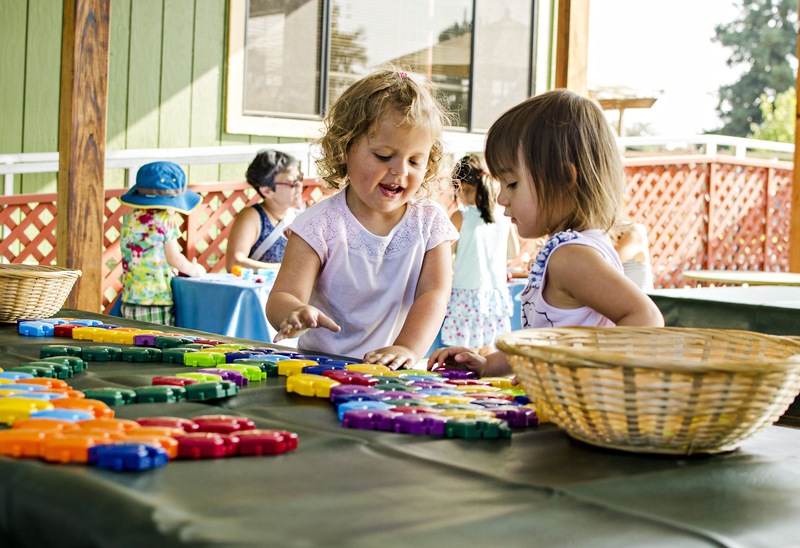 MVPNS is the only NAEYC accredited co-operative nursery school in Mountain View. The MVPNS Director (and teacher of the 3's program) is on faculty at Foothill College's Child Development Program. The teachers for our M/T/W/TH afternoon program published a book inspired by the MVPNS curriculum, which won the national 2011 Teacher's Choice Award from Learning Magazine. Is the school an academic or developmental program? MVPNS is a developmental and play-based program where both children and parents receive a great foundation for the child’s future success in the academic environment. Are there any activities that the kids/families do outside of class time? There are numerous social events throughout the year such as picnics, outdoor movies, ice skating, and more. There is a Parent-Child Project, which gives the child and parent who does not attend weekday classes a chance to work together on a project. I am apprehensive about working in the classroom. What will I be asked to do? At our school, the curriculum is well thought out in advance by the teachers and all projects are well organized. Each parent is given an “area” such as bikes/swings, sandbox, project, snack. Instructions for the area are spelled out clearly on work cards, and the teachers give full and clear instructions about how the parent is to facilitate the project experience for the child. Our orientation sessions are very helpful in finding out more about this. In short, parents are not expected to be teachers, but are expected to be positive and respectful toward the children, asking open-ended questions and allowing the children to find their own answers through discovery. What if my child is sick on my work day? If you or your child are sick on your workday, or if you cannot come to school for some reason, we always have a backup “Emergency” parent scheduled to fill in. If you know in advance that you will not be able to attend, you are expected to try to find a substitute via email or phone calls. You can always switch days with each other. What time should I arrive on my work day? There are tasks that need to be done before the children arrive. Project parents will need to be briefed by the teacher on the projects of the day. The teacher needs to be able to greet the children at start time, instead of talking to the work parents. The Emergency (extra/fill in) parent will only be able to leave when all work parents are there, so it’s important not to keep them at school unduly long. My child has separation anxiety. Do I have to leave on my non-work days? Our goal is for you and your child to have a gentle transition into the nursery school. Our teachers are adept at minimizing the anxiety that a child feels when at school without their parent. Each situation is considered and handled individually. My child has food allergies. Is this a problem? MVPNS has had many children with a variety of food allergies. We are a nut-free school. No nuts of any kind are allowed on campus at all. At the start of each school year, we all discuss any food allergies in the classes, and the severity of the children’s reactions. Any foods that are deemed dangerous to a child are not used during that child’s class. Any foods that cause life-threatening reactions are kept out of all classes in order to ensure a safe environment. Some classes will have few or no allergies at all, and other classes will have a long list of foods that children are allergic to. The teachers work with parents to work out a policy to fits the needs of the children. My spouse and I both work full time. Can our family participate in the program? Absolutely. We have families whose parents can participate in the work days themselves, and other families which have a caregiver or extended family member who can consistently attend school with the child. We will work with you to find a solution that fits your family. I just had a baby – can I bring the baby with me on work days? Babies are welcome up until the age of six months, at which point they get very active and you will need to find an appropriate childcare situation. Often, parents with younger siblings will watch each other’s children on work days. Do you have an automatic payment system for tuition? We currently accept online banking checks which can be mailed to our P.O. Box. I have twins – how many work days and committee responsibilities will we have? With regards to work day requirements, a family with multiples in the 3's class will be assigned approximately 4 - 6 work days per month. Families with multiples in the 4's or 4/5's class will work approximately 6 - 8 days per month. Job responsibilities are per family, not child, so each family is only assigned one committee job or board position, such as membership team, class photographer, laundry, president, etc. What kinds of committee jobs are there to choose from? Since all the operations functions of the school are performed by the parents, we have a huge variety of jobs for families to choose from. You can choose a job that makes use of your unique talents and fits your families schedule. Some examples include laundry, playdough, curriculum support, technical infrastructure support, event organization and promotion, beautification, etc. How much of a commitment is it to be on the Board of Directors? We have monthly meetings which usually last one hour. Each board member is responsible for an area of operation. Some are more time intensive than others. They range from Adult Education Speaker Bookings to School Auction organization, Treasurer, Secretary, Beautification, and Co-President. In exchange for your service, we waive the six hours of beautification work required of all families. Often, the board committee responsibilities can be shared by co-chairs. The school sounds great, but we have limited financial resources right now. Can you help? If you are interested in joining our community of families and the financial commitment is stopping you, then please contact Membership or our Director to confidentially discuss tuition assistance. Have more questions? Please contact us at info@mvpns.org.